Ceramic Pour Cups | High Temp Inc.
High Temp Inc manufacturers a wide range of high quality ceramic pouring cups for the investment casting industry. Our complete “in house” manufacturing process allows our customers to have the freedom to use a pouring cup that fits their needs without limiting them to “standard sizes”. HTI developed and uses a proprietary high quality mullite formula that is characterized by structural integrity and high thermal shock resistance. 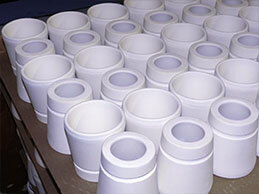 Our pouring cups have been proven at some of the most well known investment casters in the world. If your needs are a conical shape, a shoe style cup or a custom shape that is very specific to your process, HTI is dedicated to providing their customers exactly what they want.